Home>Alhambra >Take your kids to the Alhambra! No blog post or web page can do justice to the brilliance of the Alhambra. Truly seeing is believing. And I am converted. I have lived in the vicinity of Granada for four years and have always been, until today, ashamed to say that I had not been to the Alhambra. I claimed pregnancy and early motherhood as my excuse for not visiting. I was slightly daunted by the reputation of the place and I didn’t think that I could truly enjoy it with a child in tow. And perhaps I was right until now. This weekend old friends were visiting Granada from Dublin (as part of a fantastic tour of Andalucía: Sevilla, Cadiz, Cordoba and Granada) and I went to meet them with my three year old at the Alhambra ticket office. We spent six wonderful hours wandering, chatting, dipping our hands and toes in fountains and generally exploring the gardens and palaces of the Alhambra. I was so proud of my little girl. She didn’t moan or complain. She took in all the sights and climbed all the stairs. I had to carry her a few times but really she was brilliant. She was in the company of my friends’ charming nine year old son who couldn’t have been a better companion for a little girl exploring the Alhambra for the first time. I don’t know how they both lasted for six hours, frankly I was amazed, but somehow they discovered it together and kept each other going. There were a number of pit stops including a late and brief lunch at the Parador (which doesn’t have to be an expensive three course affair and avoids the crowds), an ice cream outside the Palacios Nazaríes and a discreet wee in a flower bed when nature demanded, and a loo was not in peeing distance, but otherwise we were on the move the whole time. It is such a visual, sensual, fragrant place that you can’t help but experience it on so many levels. 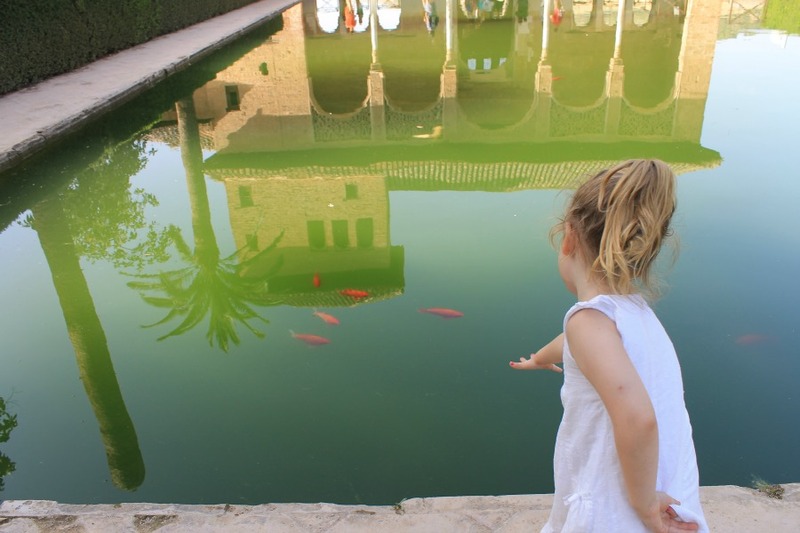 Children will be diverted by the fountains and trickling waterways, by ornate windows that look out over the Albayzín, by gardens filled with flowers and with butterflies, and winding steps up to towers with views of the city, the vega and the mountains. 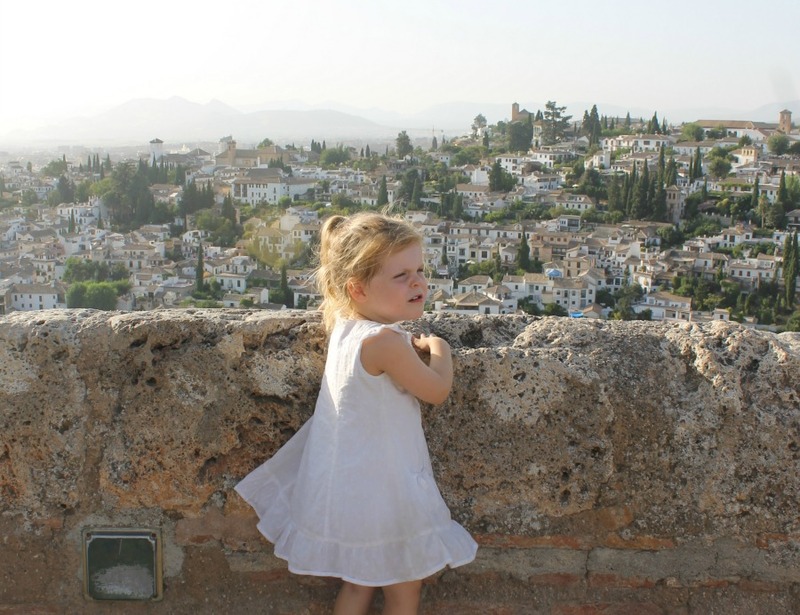 Give them the chance and children will be delighted by the Alhambra. 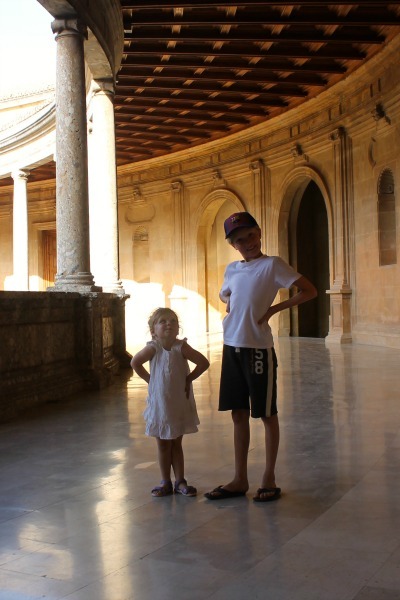 One particular highlight for our two kids was the spacious Palacio de Carlos V where they took their shoes off and ran about on the cold marble. Architecturally this Renaissance palace rather sticks out amongst all the Moorish splendour and is not known to be one of the most popular features of the Alhambra. This might explain why there were so few people in there and why it was such a good place to take a breather in the cool and calm of the upstairs gallery. It was an hour drive home and my daughter was asleep in her car seat before we hit the motorway. There was a minor meltdown as I tried to get her to from the car and into bed, but this comes as standard with my child when we have been out all day. I have come home buzzing from a magical day. We will return. * consider booking a guided Alhambra tour. Not only will you and your kids learn more about the Alhambra this way, but you’ll also skip all the queues and avoid the stress of buying the tickets altogether. * utilize your tickets fully . ie. if you are booked in for a morning ticket or an afternoon ticket, arrive at opening time and start exploring regardless of your booked slot at the Nazrid Palaces. * be aware that prams and buggies are not allowed with the Nazrid Palaces, but you can borrow baby carriers from the left luggage point next to Puerta del Vino. 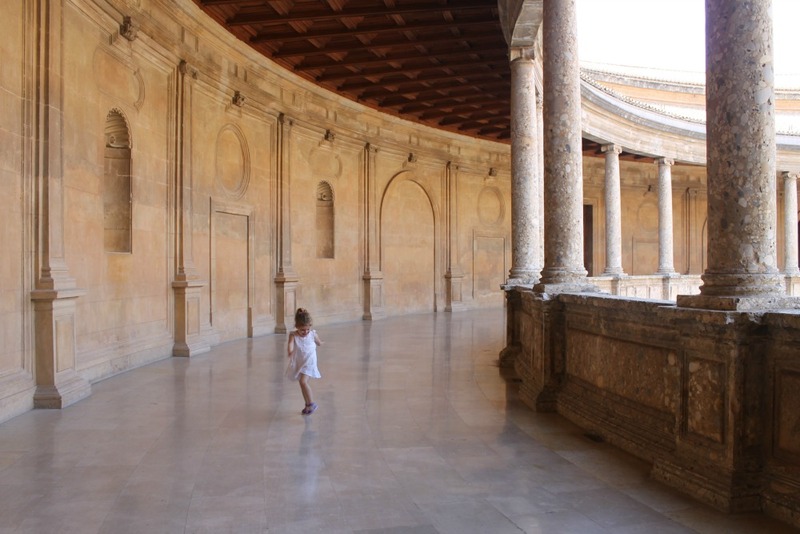 * let the kids set the pace – you can’t hope to see the whole of the Alhambra in one morning or afternoon, so don’t try. Enjoy what you can with them. It is all wonderful and your only limits are the entry time to the Nazid Palaces and closing time. * finish at the Alcazaba. There may be a few steps to climb to get to the final tower, but it feels like a real achievement at the summit of the day and it is breezy up there. * help bring the whole experience to life by doing a little history homework before you go. There are some fantastic books available that can help with just that including Prince of the Birds and Alhambra Coloring Book and Alhambra Stained Glass Coloring Book Also Tales of the Alhambra for Children. 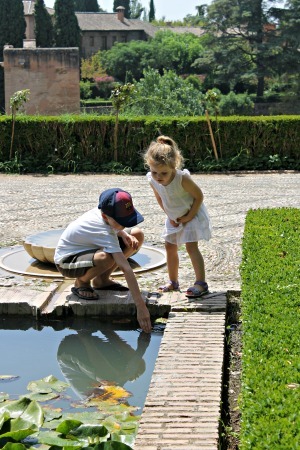 I would love to hear about your experiences of, or answer any questions about, visiting the Alhambra with the kids. Or perhaps you have some tips for surviving sightseeing with children that you would like to share. Please leave a comment below.